The electronic flight bag (EFB) has demonstrated improved capability to display aviation information such as airport charts, weather, NOTAMs, performance data, flight releases, and weight and balance. This portable electronic hardware has proven facilitative for flight crews in efficiently performing management tasks. 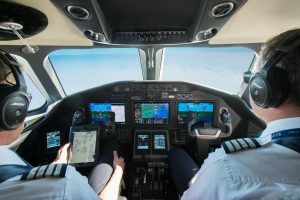 While the EFB provides many advantages and extensive improvements for the aviation community in general and for pilots specifically, some unexpected operational threats have surfaced. An ERJ175 pilot attempted to expand the EFB display during light turbulence. Difficulties stemming from the turbulence and marginal EFB location rendered the EFB unusable, so the pilot chose to disregard the EFB entirely. “We were on short final, perhaps 2,000 feet above field elevation. [It had been a] short and busy flight. I attempted to zoom in to the Jepp Chart, currently displayed on my EFB, to reference some information. The EFB would not respond to my zooming gestures. After multiple attempts, the device swapped pages to a different chart. I was able to get back to the approach page but could not read it without zooming. I attempted to zoom again but, with the light turbulence, I could not hold my arm steady enough to zoom. [There is] no place to rest your arm to steady your hand because of the poor mounting location on the ERJ175. “After several seconds of getting distracted by…this EFB device, I realized that I was … heads-down for way too long and not paying enough attention to the more important things (e.g., acting as PM). I did not have the information I needed from the EFB. I had inadvertently gotten the EFB onto a company information page, which is bright white rather than the dark nighttime pages, so I turned off my EFB and continued the landing in VMC without the use of my EFB. I asked the PF to go extra slowly clearing the runway to allow me some time to get the taxi chart up after landing. The award-winning publication and monthly safety newsletter, CALLBACK, from NASA’s Aviation Safety Reporting System, shares reports, such as the one above, that reveal current issues, incidents, and episodes of some common problems that pilots have experienced. In this issue, we learned about precursor events that have occurred during the EFB’s adolescence. Circumstances can crop up anywhere at any time if proper sequence and procedures are not planned and followed. We encourage you to learn and use the TapRooT® System to apprehend situations and find and fix problems. Attend one of our courses. Among our offerings are a basic 2-Day Course and an advanced 5-Day Course. You may also contact us about having a course at your site.